It’s finally warming up and beach/lake/pool season is upon us (at last!). But beach going can also mean a lot of waste – as we pack our snacks, beverages, and the like. Here’s my go to guide on how to stay green while getting yourself a little (or a lot) of vitamin D! You’re going to get hungry at some point during the day – skip the ziplock bags and opt for reusable snack/sandwich bags. You probably want a bit of color, but you aren’t looking to roast. Keep in mind that sunscreen should be a last resort – wear clothes to shield yourself from too much sun and be sure to bring an umbrella for shade. There are eco-friendly sunscreen options out there that actually work! Here’s a friendly little list for you. Don’t bring your plastic bags (if you have any) to the beach! The last thing our oceans need are more plastic in them. Bring your totes, or my favorite, an ECOBAGS® string bag (perfect for keeping the sand out of your car). Most importantly – remember to take your trash (if you make any) with you to dispose of properly! We’re so excited that Eco-Bags Products founder & CEO Sharon Rowe will be speaking at the 2016 Indie Beauty Expo in New York on Thursday, August 25th. Sharon will be speaking along with Gay Timmons President of Oh, Oh Organic; Brena Brock founder of Farmaesthetics; and Rona Berg editor & chief of Organic Spa Magazine. They will be discussing transparency, social responsibility & certifications, ingredient sourcing & formulation, and the value of ethical and sustainable business practices that impact all who come into contact with the product. If you’re in the trade join us August 25th at the Metropolitan Pavilion. If you aren’t – explore iBE’s “shop indie” event on August 24th! This won’t be something you want to miss! Why We Love Block Island Organics Sweepstakes! Enter to Win the PERFECT ECO Beach Bag! 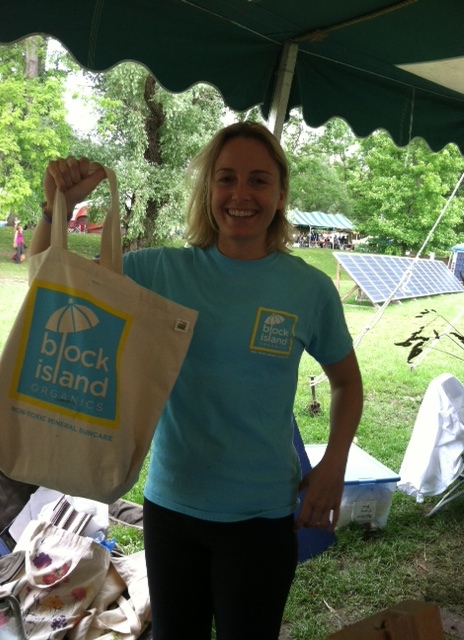 Lauren von Bernuth of Block Island Organics holding her custom print tote by ECOBAGS®! So lately I have been taking a better look at what I am not just putting into my body – but also what I have been putting onto my body – because our make-up and beauty products don’t just go skin deep, they actually infiltrate our pores and end up inside our bodies and bloodstream. What is the point in taking such care to not eat chemically modified food – when I am putting chemicals into my body from my beauty regimen? And it’s not just foundation, mascara, and eyeliner that you should be worrying about being full of chemicals – there is also a ton of chemicals in your everyday lotion and your sunscreen as well! That is why we here at Eco-Bags love Lauren von Bernuth of Block Island Organics. She makes non toxic, organic sunscreen that really works. Lauren decided she wanted to recommend sunscreens to her day spa customers. 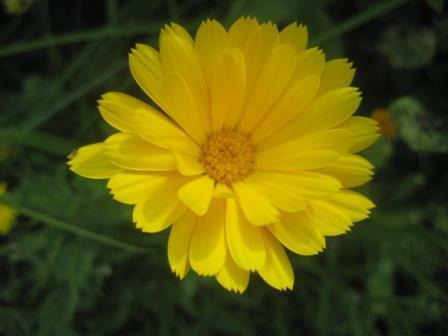 She looked and looked and couldn’t find any that really worked and were certified organic, non toxic. So, Lauren started a company to make the sunscreen. We love people who take positive environmental action into their own hands – especially the women who do so! We are so proud that she partnered with ECOBAGS® for her custom print tote bags! Want a chance to win the PERFECT beach bag? You can enter to win a beautiful new sami Floral boho sling tote complete with a bottle of sunscreen from Block Island Organics and delicious reads including, The Power Trip by Jackie Collins and Why Can’t I Be You by Allie Larkin. For a chance to win, fill out your details below and just ‘like’ us on Facebook or follow us on Pinterest!